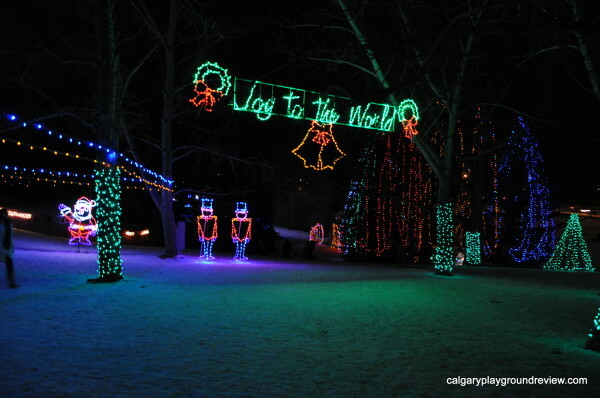 The Lions Festival of Lights display, not just drive by display – you can also walk through it too. 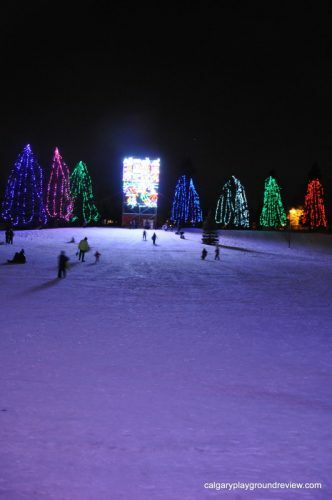 It’s perfect for taking the kids in a sled and many people toboggan down the hill on the west side. 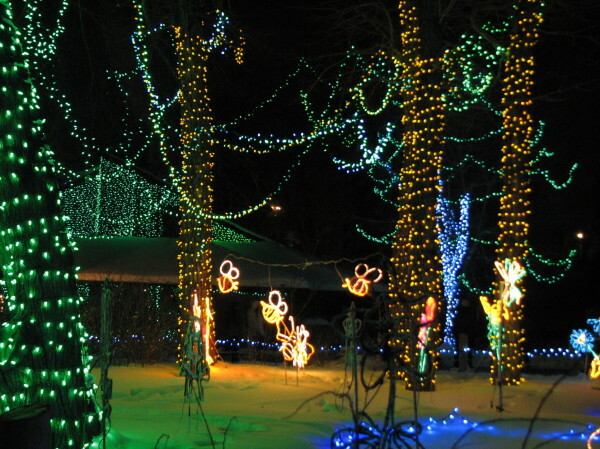 You can cross a bridge (behind the shed), and see some more of the lights closer to 14th St. 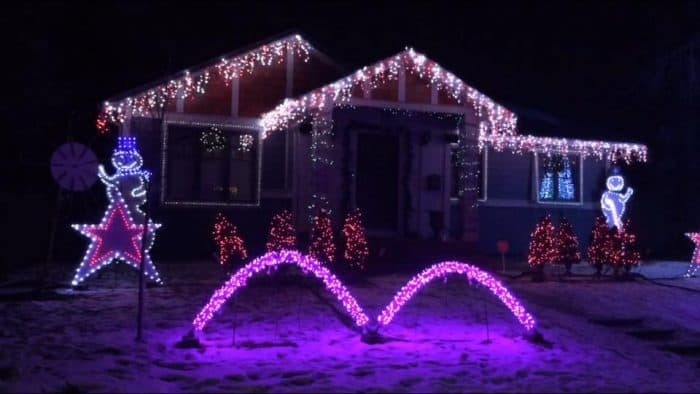 The lights are lovely, it’s free, and it doesn’t take up a lot of time. The one downside is that there is nothing in the way of amenities and the parking is really just neighborhood street parking. This is the area right by the entrance. It is a good spot to meet up with people. If you go under this sign you’ll find yourself walking past the toboggan hill. If you look to the east (right) you’ll see a shallower slope. View of the toboggan hill. The lights to our right are the ones you can see from 14th St. The toboggan hill is to our left. 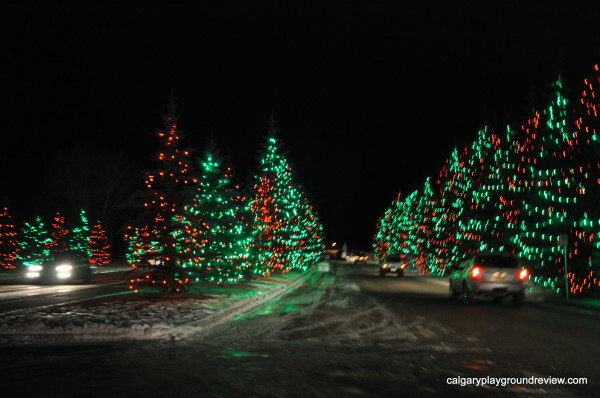 Spruce Meadows is primarily set up as a driving tour but there are places to park if you would like to walk around the centre area. 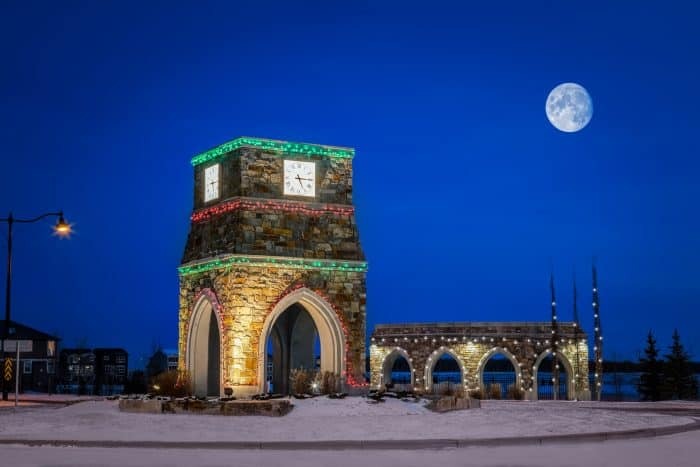 You can enjoy a hot chocolate or coffee and a pastry in the warm comfort of the Founders Plaza from 5-8pm. 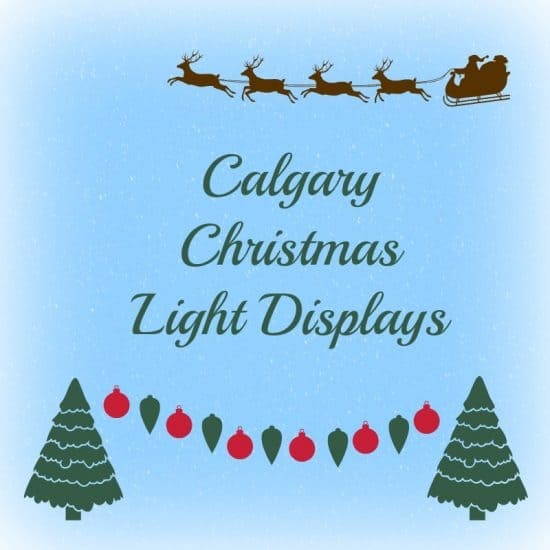 The lights here are less varied, than some of the other spots on this list, but they are plentiful and you can drive right though. 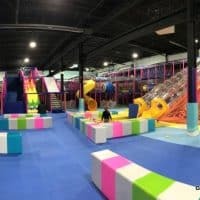 If you live in the area I would put it on your must do Christmas list. 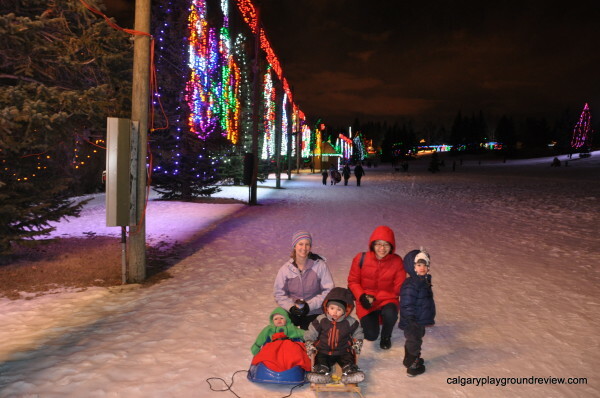 There will also be a family skating pond this year from 10-4pm, weather permitting. 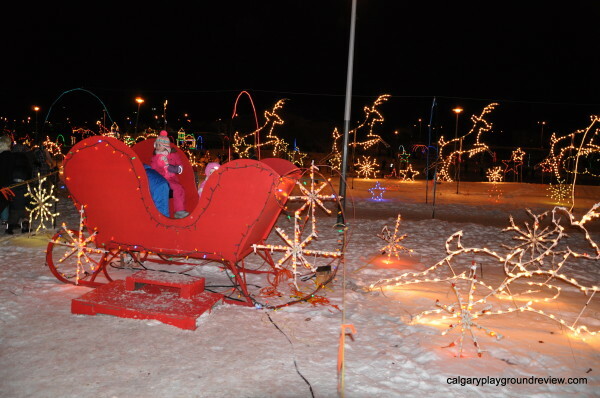 The Airdrie Festival of Lights is a real community event. 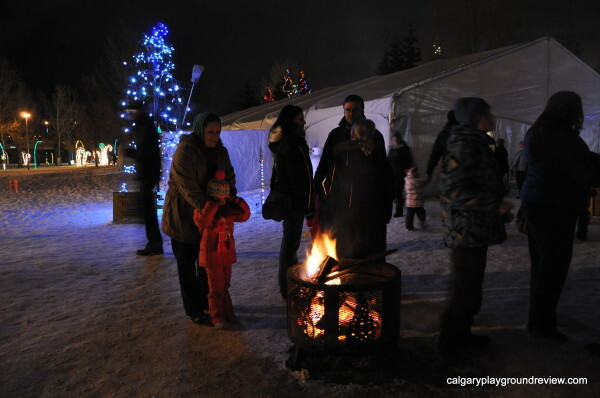 The walk through light festival features two bonfires, a miniature train the whole family can ride ($2 per person) and a concession serving hot chocolate for $2 (cash only). 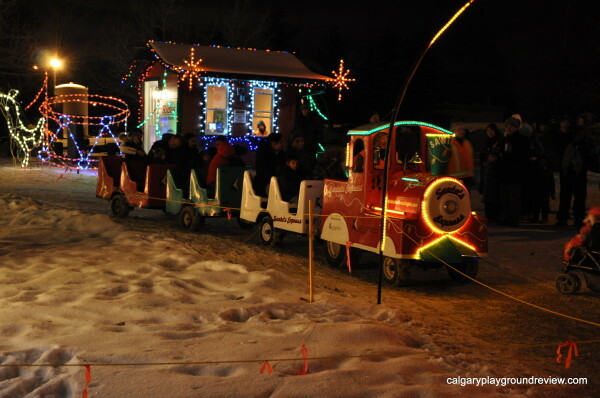 They also have special nights including things like crafts, visits with Santa and free hot chocolate. 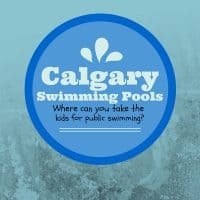 Check out their events calendar for specifics. 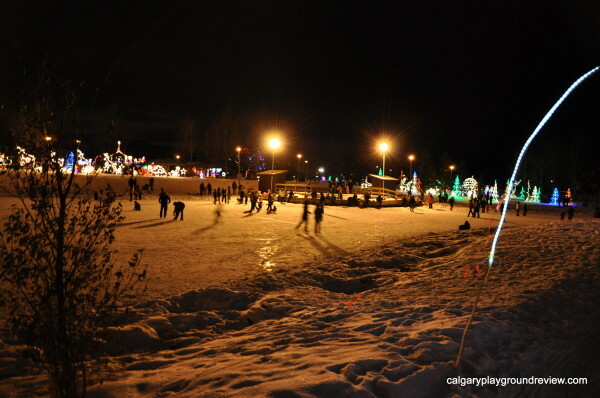 The pond is also used for skating. 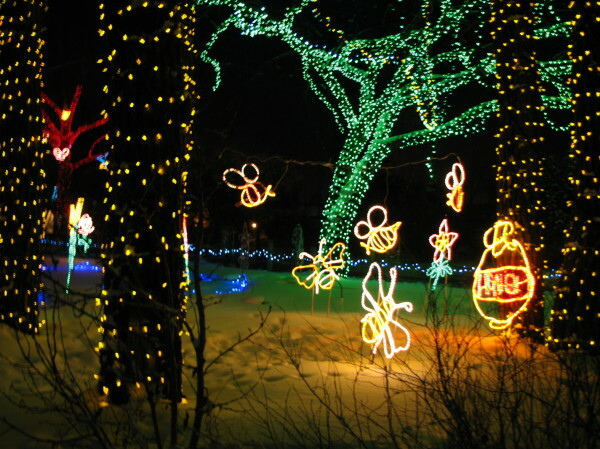 The lights are plentiful and in lots of different shapes. 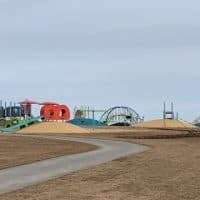 There are lots of pathways to walk around and strollers or sleds will probably work most days. One of the two trains running while we were there. They also have some photo-ops set up like this sleigh and a number of those cut-outs where you stick your head through. I would absolutely recommend making the trip up. It has become my favorite of the ones on this list. 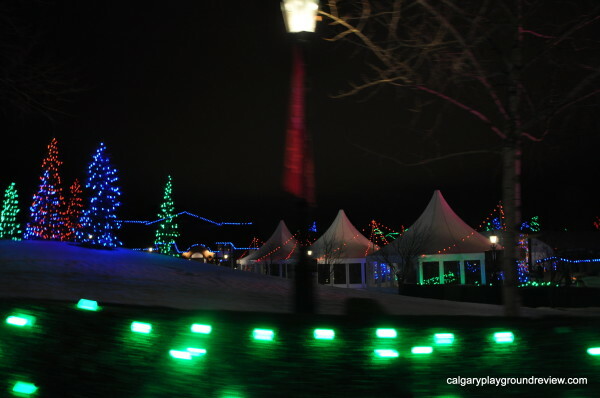 Zoolights is back again this year and if you like Christmas lights, zoolights really is something to see. 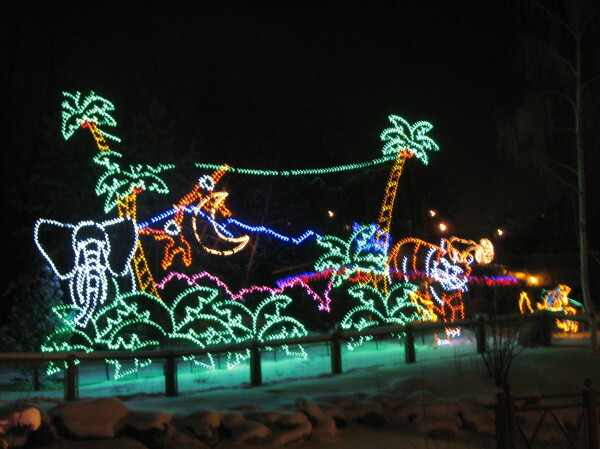 Not only does it have a lot of lights, they are shaped into amazing (often animal themed) decorations. 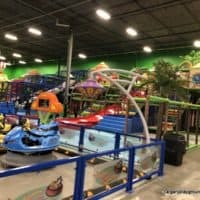 In addition, they have four fun activity zones, skating rink, free visit with Santa and more Here’s some pictures I took a few years ago. This is only a small portion of what you’d see there. 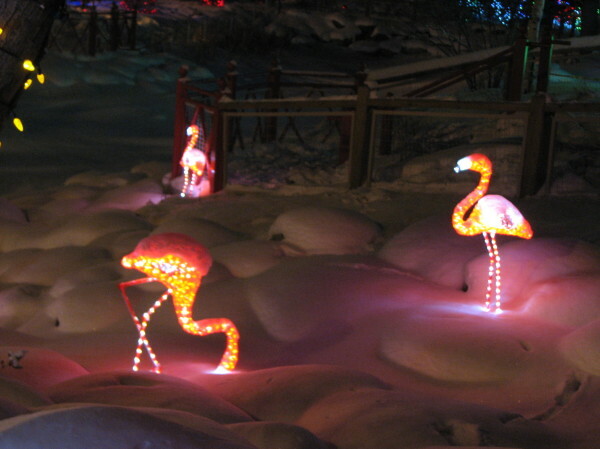 Note: the animals are not on display during zoolights and their buildings are closed. 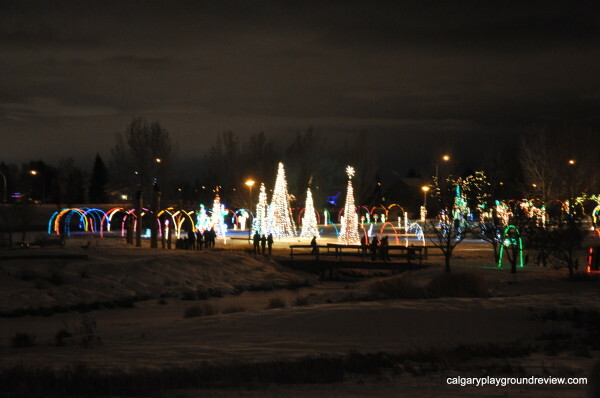 Drive through Legacy to see this community wide light display. 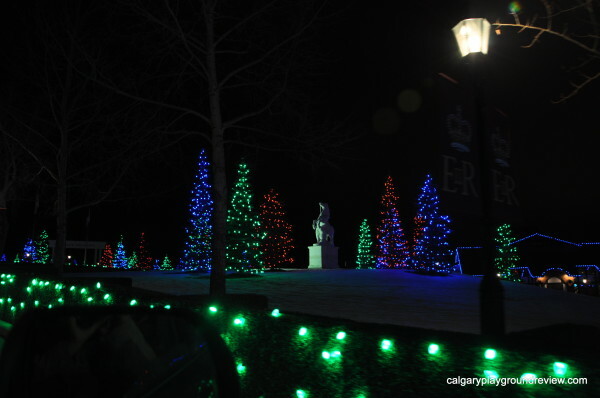 With 100,000 lights just in the parks, 28 decked out show homes and the community also participates in a competition to decorate their homes. Inside The Core shopping centre you can find 150 lit Christmas trees. 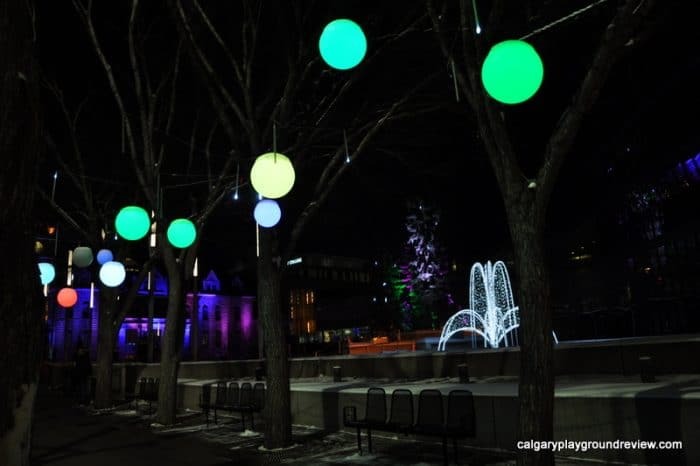 They will be on display from the tree lighting on Nov 23 (4-8pm) until Dec 20. 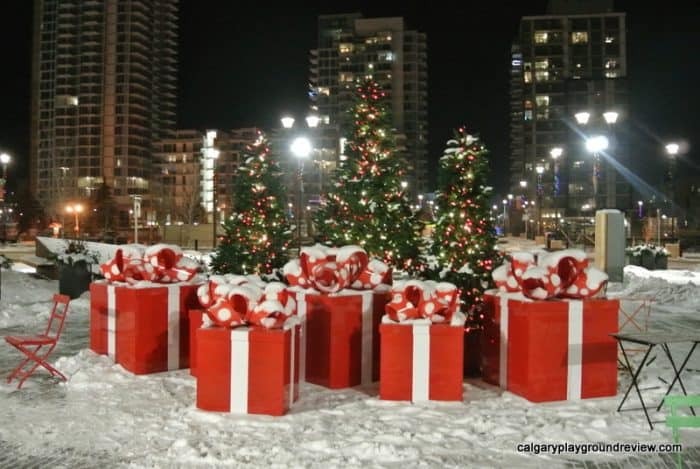 If you are near the East Village, they have a really cute display with trees and presents. 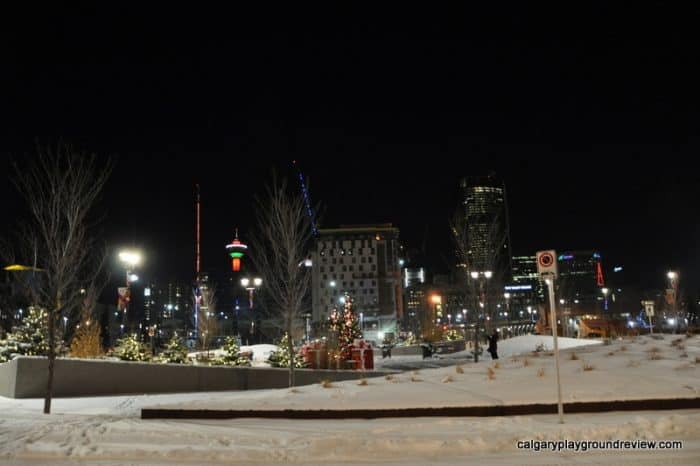 You can also see the skyline with the Calgary tower as well as the decorations on the Telus building from here. 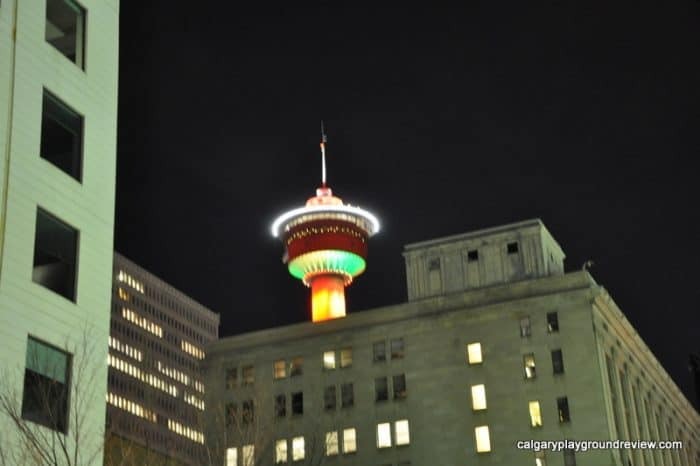 While you are downtown, be sure to take a look at the Calgary Tower. You can get a great view from all kinds of places – it’s not necessary to go right to the tower. 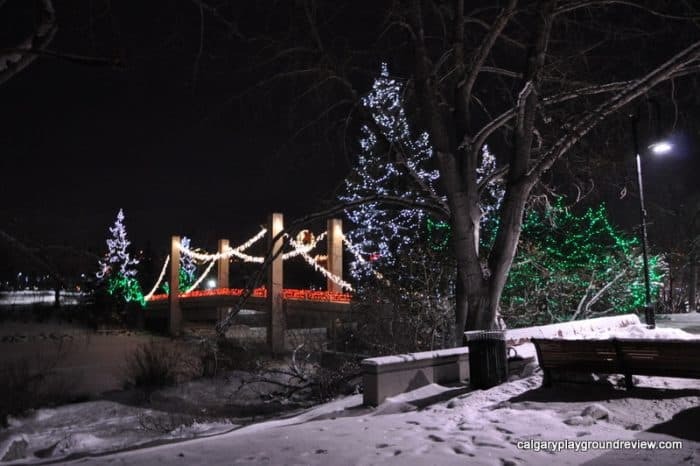 The bridge from Eau Claire to Prince’s Island is beautifully lit. 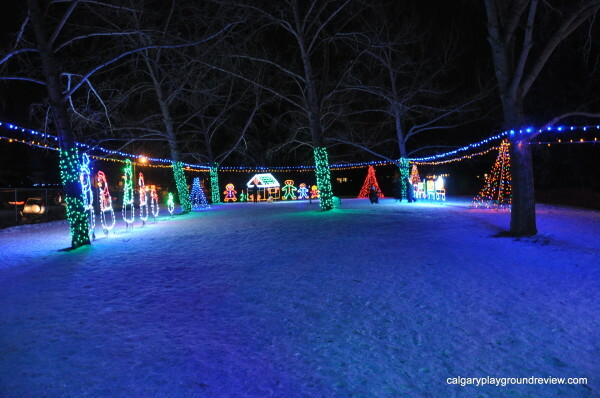 There’s also some nice lights on Prince’s Island too. McDougall Centre – 4th Ave and 6th St. 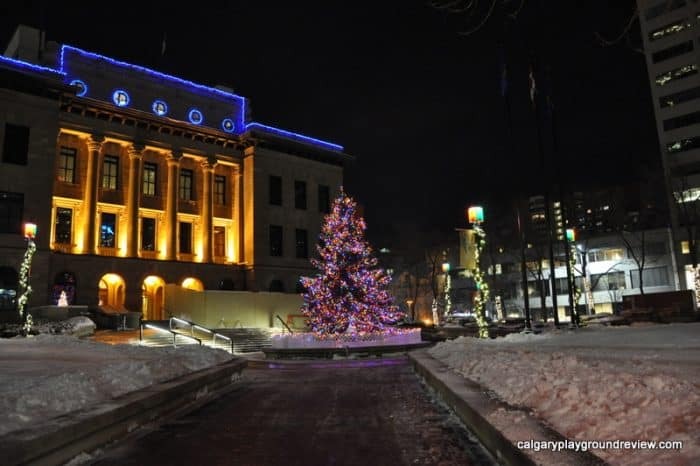 Both sides of the McDougall Centre look beautiful. City Hall is my favorite spot downtown, it’s right by Olympic Plaza so if you are over there skating make sure to walk over. 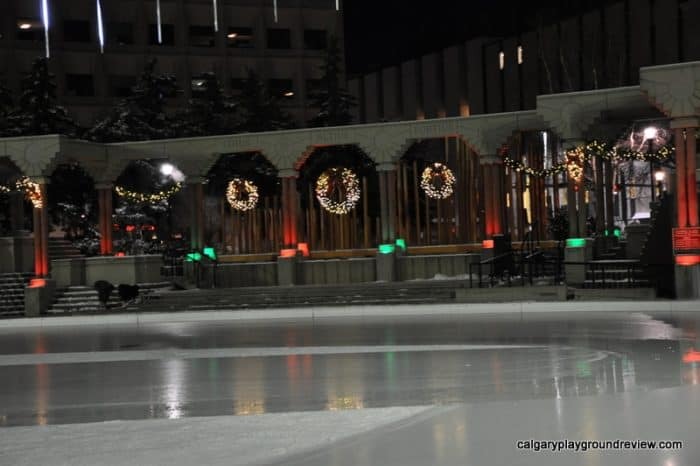 Olympic Plaza has some beautiful wreaths, a lit tree and free public skating too. 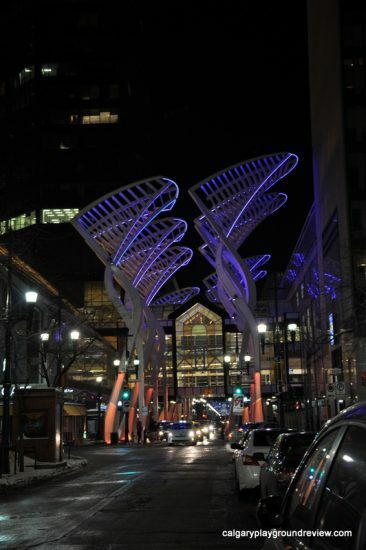 Driving or walking West along 8th avenue from Olympic Plaza is lovely with light strung across the street. 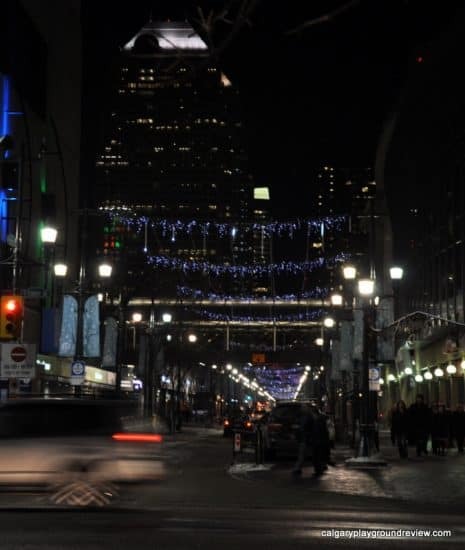 From Crescent Road you can get a pretty view of downtown and a great view of the Telus building decorations. 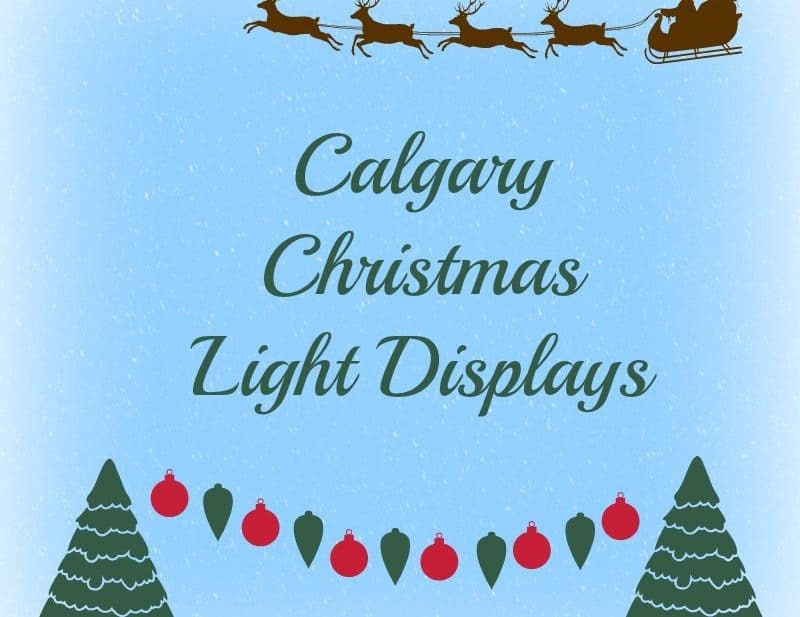 Where is your favorite place to see Calgary Christmas Light Displays? 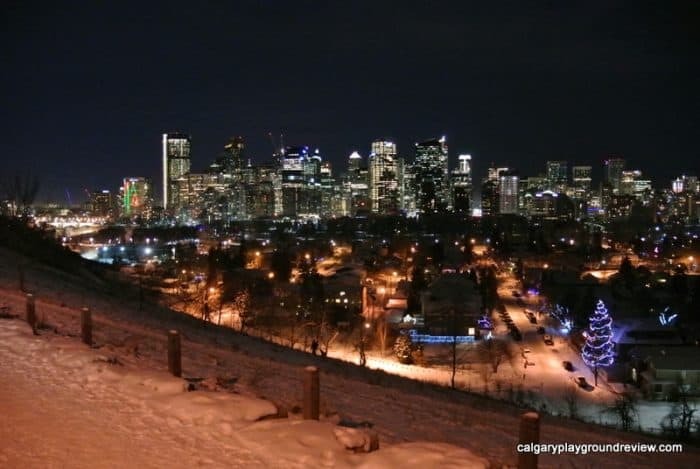 We like walking along Crescent Heights for the downtown views and Christmas lights! Where is Legacy?